Back in 2016 we had an idea; wouldn’t it be great to have a community launderette that offered affordable washing and drying facilitates, and used all that extra space for events and activities? Well, three years later, with a lot of hard work and planning, we’re on our way to making this idea a reality. We’re deep into the renovations of our brilliant launderette space so we wanted to share what we are working on with you. We’re starting a new blog series documenting our journey to opening. First up to share their work is our lead builder Ehsan. My name is Ehsan and I am leading on the renovations of the laundrette space. I wanted to share the work I and our team of volunteers have been leading on, as well as some great photos of the work we are doing to get our launderette ready to open in a few months’ time. I’ve been part of the Kitty’s team since 2016. 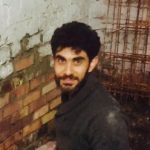 This part of the project is where I can really contribute the most; it draws on many of my skills for welding, carpentry and design, as well as my passion for learning new crafts, experimenting with materials and working as part of a team. I have been working with a great group of volunteers: Fred, Ahmad, Rick and Michael. Our first obstacle of the space was the floor. The existing floor was broken in places and very uneven, digging this out was a massive job but we undertook it with lots of people power and had the job done in a few weeks. 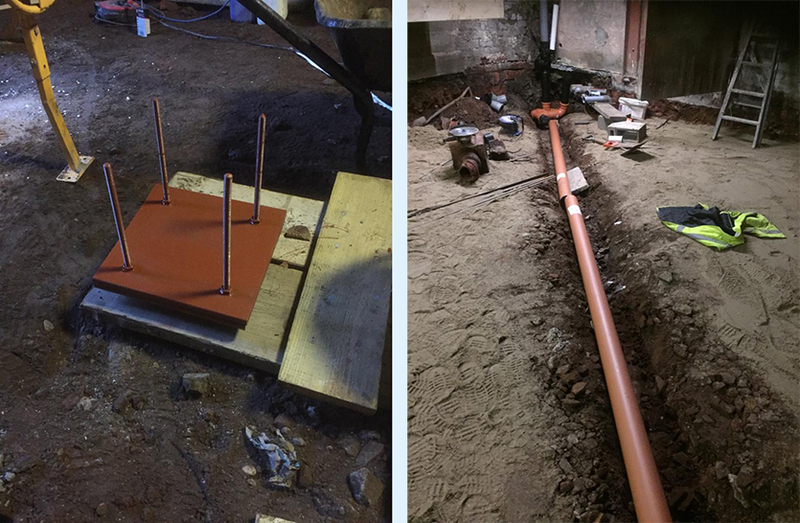 This work provided us with the opportunity to lay a new floor that is insulated and damp-proofed, while at the same time sorting out the drainage for the washing machines and putting some foundations for structural steel supports. The new floor is a big part of the look of the launderette so we wanted to experiment with designs and materials to create something visually interesting. Over a conversation at Granby Market we discovered that Granby Workshop had a load of tiles that didn’t come out quite right and that we could have them to create a new colourful aggregate surface. We broke them up and put them into our floor. We love to collaborate with other creative organisations and giving this beautiful material a new life was exciting for me and the team. Although I have experience of laying concrete, it was great to have the support of the team at Penny Lane Builders, who offered advice, contacts for materials and some friendly, experienced workers on the long-awaited day of pouring the new floor. The floor took a long time but it was very important part of the job, especially as we were using the donated Granby tiles, in the end it was worth the extra time and effort for a beautiful finished result. Process of putting the tiles in and grinding them for finished result before sealing. Another important part of this structural stage for the team was the welding new steel beams and supporting posts, which I did following the helpful advice of our structural engineer, Paul. I enjoy my job because I get to be involved with each part of the transformation of the space. I can see the potential and imagine how the launderette will look when it’s finished, giving me motivation to go further. I know the end result will be filled with the energy and craft of everyone who has worked on it.